Whether you are ready to advance to the next level of yo-yoing or take your tricks to that next level then we have the yo-yo for you. This is the latest 'budget' all aluminum yo-yo from C3yoyodesign. We present LEVEL 6. Rather than start from scratch on the Level 6, C3 set out to build a model that was reflective of the popular design elements in their current signature series yo-yos. 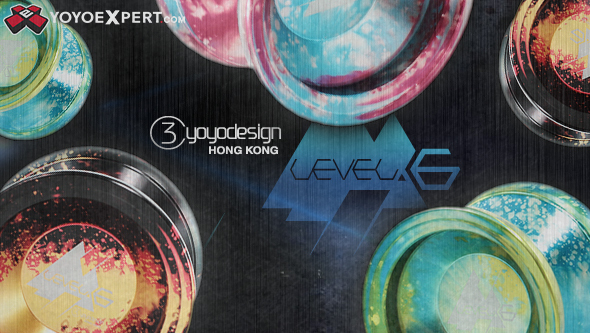 The Level 6 is built on inspiration from many of the core C3 sponsored players and their yo-yos: Shinya Kido's Krown, Ethan Wong's Mo-vitation, & Peter Pong's P.wave! Level 6 is a elegant blend of everything that C3 represents! Available in an array of stunning acid-wash colors and a very affordable price tag, The Level 6 is definitely an excellent choice for the unresponsive player whether they are learning their first string trick or getting ready for a major contest.